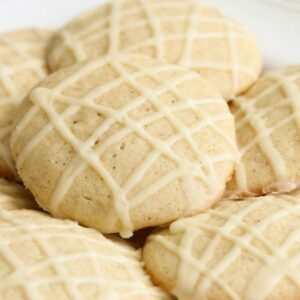 Everyone loves these soft and tasty Eggnog Cookies with hints of cinnamon, nutmeg and vanilla. These cookies are also topped with an eggnog glaze and are perfect for the holidays. Begin by creaming together butter and sugar until fluffy. Add eggnog and mix until well combined. In a separate bowl combine flour, baking powder, nutmeg, and cinnamon. Mix. Add flour mixture to butter mixture and mix until well combined. Using a cookie scoop, drop batter onto parchment lined baking sheets. Make glaze by mixing powdered sugar and eggnog. Drizzle over cookies and ENJOY!